Time to get off the beach, put some trousers on, and find the socks … it’s 2019 and we’re raring to go! What better way than to make sure we are heading in the right direction by checking out how we ended 2018. 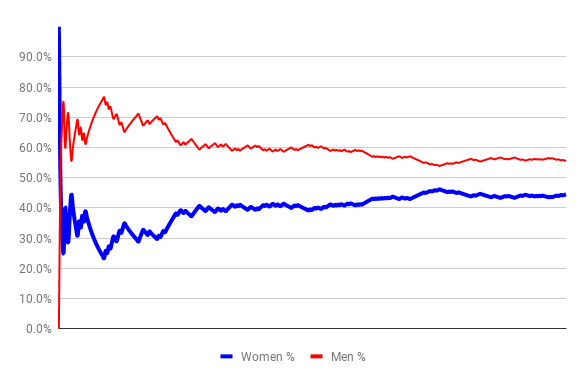 As you know by now we have focused upon our gender split with our guests (and team) and we’re pretty happy with the numbers … but it’s gonna be given a huge shot in the arm during 2019! note: we have been binary about gender, we will review this during this coming year but we aren’t in the business of “outing” people and non-binary stats aren’t enough at the moment to guarantee anonymity. In 2018 we used “studio 2” a lot but in 2019 we’re going to expand our options, use many more venues and get amongst it more - this will happen anyways as Viv and Vic bring in more episodes from outside of Wellington. Note: our next #WellyTech get-together in the our new “System Error” format will be at Little Beer Quarter. So how many episodes did the team publish - 136 in 2018. ONE HUNDRED AND THIRTY SIX!